Save by combining your lodgings and airfares. 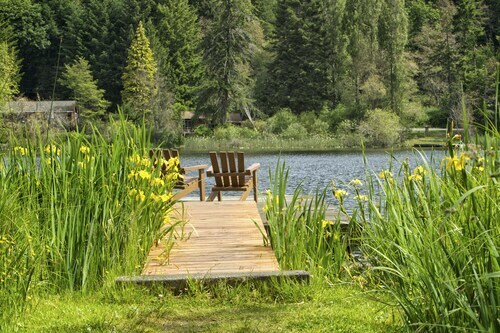 Expedia has plenty of outstanding Salt Spring Island vacation packages that'll save time and give you more cash to splurge! With more than 400 partner airlines and 321,000 worldwide properties for you to choose from on our expansive database, you'll be setting off on your next vacation in no time! It's nice to just stroll around the streets in a new place, but sometimes it's a good idea to come up with a plan. Grab your schedule — we have plenty of awesome ideas for your upcoming Salt Spring Island vacation. Time spent in nature is proven to enhance both your psychological and physical state of being. Visit Mount Maxwell Provincial Park and reap the rewards of reconnecting with our natural environment. There's a wonderful range of things to keep you busy in this destination. One of the best ways to really immerse yourself in an area's culture is to stroll its bustling marketplaces. Browse the merchandise and shop like a local at Salt Spring Saturday Market. Still have time on your hands? Cap off your your break by visiting Gary Oak Winery. Check out the winery, book a guided tour and try a sample of the end product! Finding somewhere comfortable to stay is often crucial to the ideal luxury getaway or cheap vacation. 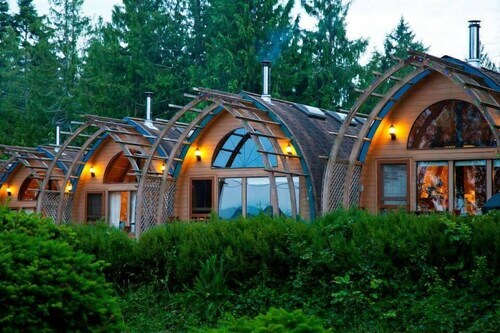 With only 9 accommodations in Salt Spring Island, be sure to book as soon as you know your dates. Begin your vacation on a luxurious note by sliding between the high thread count sheets at the Hastings House Country House Hotel (160 Upper Ganges Road). Alternatively, the Seabreeze Inne (101 Bittancourt Road) is a fantastic place for the budget-conscious traveler to get their shut-eye. If you're coming in by plane, it's most likely that you'll be landing at Victoria International Airport (YYJ). Once you've retrieved your suitcase from the carousel and exited the terminal, the heart of Salt Spring Island will be just 12 miles (19 km) away. 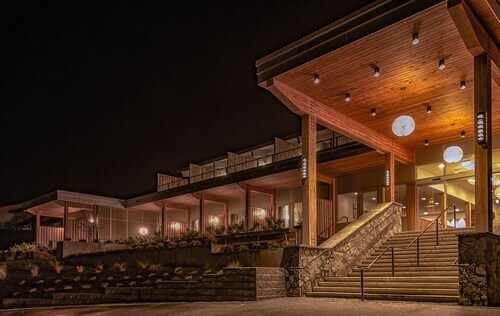 Situated on the waterfront, this hotel is within a 10-minute walk of Saltspring Marina, Ganges Marina, and Salt Spring Island Visitor Centre. Salt Spring Saturday Market and Artspring Arts Center are also within 15 minutes. This Salt Spring Island chalet is on the beach, 0.3 mi (0.4 km) from Wallace Island Marine Provincial Park, and within 12 mi (20 km) of Ganges Marina and Crofton Ferry. Salt Spring Vineyards and Mount Maxwell Provincial Park are also within 16 mi (25 km). Situated in Salt Spring Island, this cottage is within 2 mi (3 km) of Saltspring Marina, Ganges Marina, and Salt Spring Island Visitor Centre. Salt Spring Saturday Market and Mistaken Identity Vineyards are also within 3 mi (5 km). 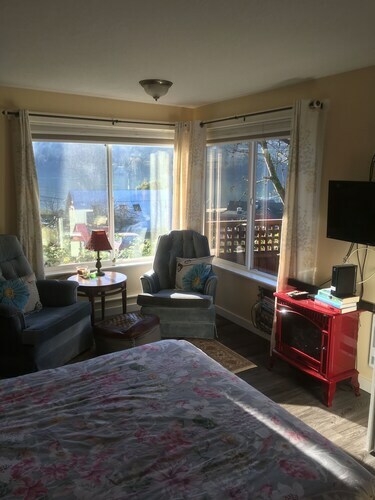 Situated in Salt Spring Island, this motel is within a 15-minute walk of Salt Spring Saturday Market, Artspring Arts Center, and Salt Spring Island Visitor Centre. Ganges Marina and Saltspring Marina are also within 1 mi (2 km). 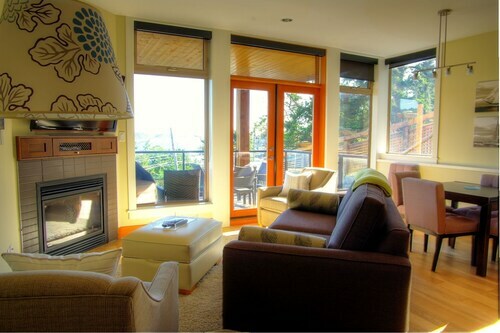 Situated in Salt Spring Island, this condo building is steps from Ganges Marina and Salt Spring Island Visitor Centre. Salt Spring Saturday Market and Artspring Arts Center are also within 5 minutes. 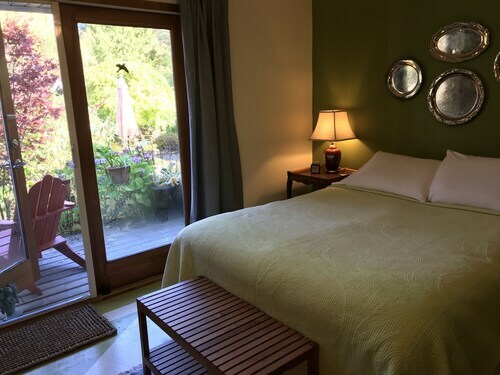 Situated in Salt Spring Island, this guesthouse is within a 15-minute walk of Ganges Marina, Mistaken Identity Vineyards, and Salt Spring Island Visitor Centre. Saltspring Marina and Salt Spring Saturday Market are also within 15 minutes. This Salt Spring Island cabin is on the beach, 1.6 mi (2.5 km) from Cusheon Lake, and within 6 mi (10 km) of Fulford Harbour Terminal and Ganges Marina. Saltspring Marina and Artspring Arts Center are also within 6 mi (10 km). 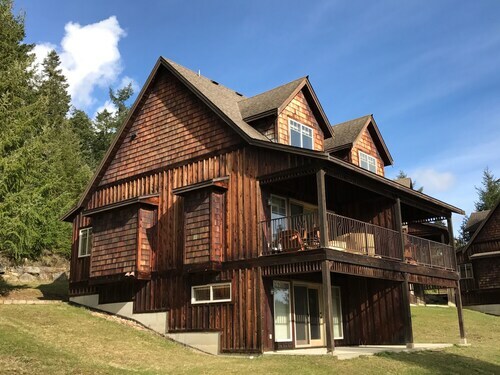 Situated in Salt Spring Island, this guesthouse is 0.1 mi (0.2 km) from Fulford Harbour Terminal and within 6 mi (10 km) of Garry Oaks Winery and Gary Oak Winery. Salt Spring Vineyards and Cusheon Lake are also within 6 mi (10 km).